By Chris Williams: Mayweather Promotions CEO Leonard Ellerbe says he’s “very confident” WBA Super World super featherweight champion Gervonta ‘Tank’ Davis (21-0, 20 KOs) will beat Vasyl Lomachenko (12-1, 9 KOs) when the time comes for them to face each other. Ellberbe doesn’t know when that will be unfortunately, but when it does happen, he expects Tank Davis to beat Lomachenko in the same fashion as he did Hugo Ruiz (39-5, 33 KOs) in stopping him in round one last Saturday night in front of a large crowd of 8,048 fans at the Dignity Health Sports Park, in Carson, California. Ruiz, 32, wasn’t even a speed bump in the path of the Gervonta express last Saturday. Davis took care of Ruiz like he was nothing in dropping him hard with two big shots to the head in the 1st round. Ruiz’s nose gave way under the power of Davis’ hard punches, and erupted into a river of blood that leaked all over him as the fight was being stopped by referee Jack Reiss. “I don’t know,” Ellerbe said when asked about when Gervonta will face Lomachenko. 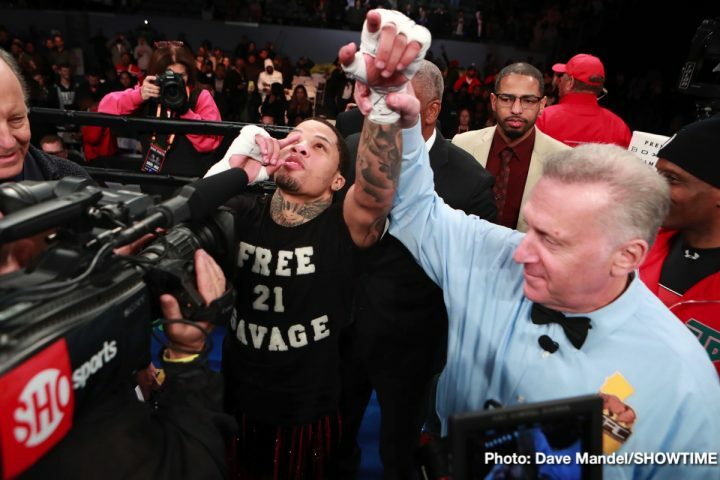 “Gervonta Davis against anybody is going to a big fight, because he’s got that star power. He’s the guy, the same way Floyd Mayweather was. Gervonta Davis going to be that guy. They’re going to call for anybody. There’s no particular focus on one guy [Vasyl Lomachenko as a future opponent for Tank Davis to fight]. I’m not concerned about that guy [Lomachenko], because I’m very confident that Gervonta beats him; very, very confident,” Ellerbe said. For a fight between those two to take place, Tank Davis will need to move up in weight to lightweight [135 lbs], because Lomachenko will likely be unwilling to come back down to 130. Even if Lomachenko did move back down to 130, it would setup a situation where excuses might get made if he were to lose to Davis. The last thing Gervonta needs is to not receive credit or beating Lomachenko by boxing fans saying that the 2-time Olympic gold medalist was ‘weight drained’ from having dropped back down to 130. There are major obstacles that will prevent a fight between Davis and Lomachenko from ever happening. Lomachenko is with Top Rank Boxing, and his fights are televised or streamed on ESPN+. Gervonta’s fights take place on Premier Boxing Champions on SHOWTIME. For them to fight each other, they would either need to meet on one of those two platforms if it wasn’t a dual televised type of a fight. Mayweather Promotions might not want to reach out to Top Rank to make the fight happen between Davis and Lomachenko. The thing is, Lomachenko, 30, is getting older, and he may not have much more tie as a top level guy before he starts taking losses. Lomachenko’s last two performances against Jose Pedraza and Jorge Linares have shown that he’s not the same fighter at lightweight compared to what he was when he was fighting at super featherweight. Unless Lomachenko moves back down to 130, he’s going to take punishment, and it’s only a mater of time before he loses or deteriorates to the point where the writing is on the wall that he’s a shot fighter. You can argue that Lomachenko is not aging well. For a 30-year-old, Lomachenko arguably looks five years older, and it could be that all of his amateur fights in Ukraine has put a lot of mileage on him. “When and if that fight happens, you’ll see the same kind of results, trust me,” Ellerbe said about the Gervonta Davis vs. Vasyl Lomachenko fight. “I don’t know if Top Rank will ever want the [Tank Davis vs. Lomachenko] fight. They have a very good promotional company with good fighters. I’ll leave it at that,” Ellerbe said. Ellerbe is telling it like it is when he says that he doubts that Top Rank will ever let Lomachenko fight Tank Davis. Top Rank has a good thing going right now with them matching Lomachenko against their own guys. If Lomachenko is going to get beaten, and believe me; he will, it’s going to be against one of Top Rank Boxing’s own fighters like Teofimo Lopez. There’s nothing wrong with that. Lopez needs a win over an old lion like Lomachenko to take his career to the next level. Gervonta is Mayweather’s protege, who he is molding slowly into a star. That’s one of the reasons why he plans on having him follow in his footsteps to face Tenshin Nasukawa this April in an exhibition match in Japan. Gervonta will be following Mayweather’s path in fighting the same guy he knocked out in the first round on December 31 in a 3-round exhibition in Japan. If Davis can make $9 million for less than 3 minutes of work like Mayweather did, then so much the better. Mayweather vs. Tenshin wasn’t shown in the U.S. You can bet that if Gervonta faces Tenshin like Mayweather wants him to in April, the fight will be shown in the U.S on SHOWTIME. Obviously, it’ll be a tough sell if they make the fight on PPV. That won’t fly unless there’s a great undercard, because even the casual boxing fans will realize that Gervonta vs. Tenshin will be over with in one round like last Saturday’s Davis vs. Ruiz fight on SHOWTIME. Davis was going to get a nice name on his resume against former 3 division world champion Abner Mares, but he bowed put with an eye injury. Ruiz was brought in as a replacement, and he didn’t do much to make it a competitive fight unfortunately. Although Ruiz talked a good game, he wasn’t able to back up his tough talk when he get inside the ring with Gervonta. Davis still wants to fight Mares, but that might not be a good idea. The boxing fans don’t want to see Gervonta beat up on two older fighters in a row. They need a young lion to be put in there with Davis so that the fight is at least competitive. Gervonta’s purse for the fight was $1 million compared to the $100,000 for Ruiz. You can expect Davis to start making more money as his popularity slowly increases. Mayweather Promotions will need to keep him busy for him to become the star that Ellerbe believes he can be. Fighting once a year isn’t going to do the job. Gervonta only fought once in 2018.